A total of 26 students and one adult were transported to the hospital after suffering from a mystery illness at Cardinal Gibbons High School in Fort Lauderdale. 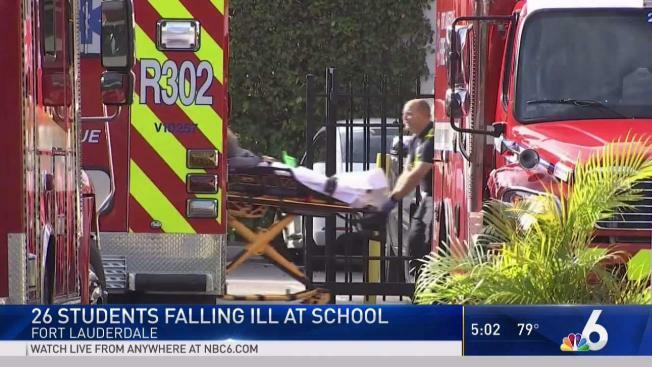 Nearly two dozen students from a South Florida school were rushed to the hospital after officials say they were exposed to an unknown substance Monday. Chopper 6 was over the scene at Cardinal Gibbons High School off Northeast 47th Street in Fort Lauderdale just after 12 p.m., with fire rescue crews saying 26 students and one adult were transported with symptoms such as shortness of breath, nausea and passing out. Fort Lauderdale Fire Rescue say eight of the students were being treated for serious injuries. The students were inside the school's gym for a Thanksgiving prayer assembly, officials said. Officials said the area of concern was isolated and the school was placed on lockdown but there was no further threat to students. Officials say they responded within five minutes and began checking almost everything that could be to blame, including cleaning supplies, AC units, gas leaks, even going as far as to do hazmat sweeps that checked for more than 5,000 chemical compounds, all of which came back negative. All patients have been medically cleared and released from the hospital, fire officials said Monday night. There is no further information on what might have caused symptoms.